January 5th was a good day to demonstrate the battery’s contribution to the home on a day on which 9.75 kWh was generated. The battery at this point in the year is configured to charge on cheap overnight electricity as well as store excess PV electricity (when there is any). The day also included evidence of water heating and car charging after I returned home at lunchtime. Over all only 2 kWh of power was purchased during the day at full price, while 12 kWh of cheap night time electricity ran the dishwasher and washing machine, did some car charging (I charge for an hour which leaves headroom for later solar charging), and contributed 5 kWh to charging the fixed battery. During the relatively sunny December day, as PV output rises, the battery starts to recharge and then, once the battery is charging at its maximum rate, remaining PV output is used to heat water (although described as ‘Grid Power Out’ in the chart above). At around 12:30 I arrived home and put the car on charge (the blue spikes) and made lunch (the brown spikes). The blue spikes of car charging occur as the chargers turn off intermittently to allow available power to be assessed. As PV output falls EV charging starts to require limited support from the battery (the rising brown line through the blue spikes) until eventually all EV charging stops and the system returns to a combination of battery charging and water heating. As the sun sets the brown line rises again as the battery takes on the load of the house. Green spikes indicate boiling the kettle before 18:00, cooking dinner from shortly after 19:00, and a further kettle boil at around 23:00. Apart from these import events totalling less than 2 kWh, the house continues running on stored energy from the battery through into the next day when the cycle restarts. At some point I assume that it will be necessary to curtail the overnight charging of the battery so that it doesn’t miss out on day time charging from PV as a result of being full. That may be responsible for some of the blue cycling with the car charging associated with the rising brown line – if the battery is already full then the car charger will be enabled at lower levels of power generation potentially causing the battery to partially support the car charging. This entry was posted in Electricity storage on 06/01/2017 by Greening Me. 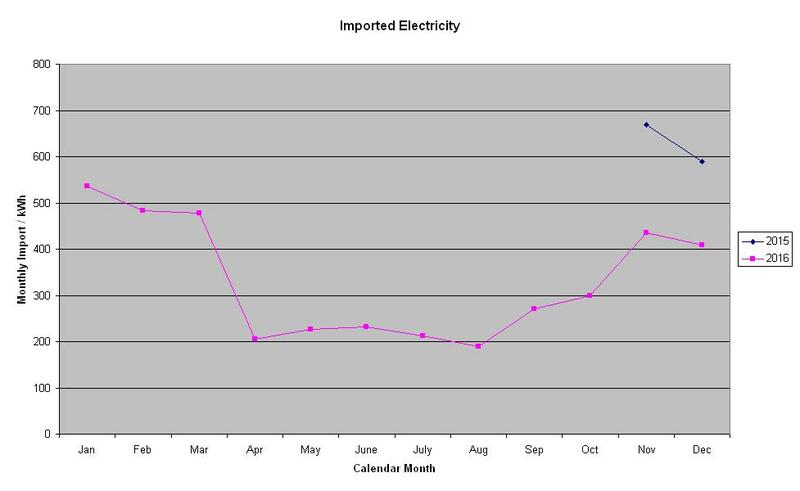 Yesterday I produced a graph of the number of units of electricity that I’d bought or imported each month since we changed to Economy 7 metering back in October 2015 – a change that I made to reduce the costs of charging my electric car. I rather surprised myself. If I ignore the months of significant solar generation where significant electricity is available that isn’t bought, then from November 2015 to March 2016 and November 2016 to December 2016 there are 6 months of consecutive month-on-month reduction in bought electricity. Comparing November and December between 2015 and 2016 (the only 2 months available for direct comparison) there’s a reduction of a round a third in bought electricity. Comparing December 2016 with January 2016, bought electricity is down by a quarter. That seems to be a compelling case for a significant reduction in import having taken place. Such a reduction could be combination of 2 sorts of things, firstly fundamental reductions in electricity use such as through having a more energy-efficient appliance, or secondly shifting use from paid-for electricity to free solar electricity (albeit that the months in question are winter months where less solar is available). November 2015 to March 2016 – Increasing availability of the garage for car charging. In November 2015 I demolished an internal partition within the garage that had rendered the remaining space too small for a car. That created an open double garage which allowed a car in for the first time since the partition was created in the 1980s. In March a suspect garage door was replaced making routine access much easier since the old door was badly corroded, required considerable effort to lift, and had an odd locking arrangement. Thus during this period garage use went from 0 to 100% utilisation for car parking/charging. This might seem an odd item to include but my rationale is that if the electric car is in the garage then it will be warmer than if outdoors and charging will be more efficient as there will be less heating and more charging. Charging also has potential to be at higher current in the garage due to the availability of a Mode 3 charger which I think is also more efficient. December 2015 – gas boiler replacement. Again perhaps not obvious at first sight, but if the new boiler gets the water hotter then less work needs to be done pumping water round radiators to take place to deliver a certain heat output at the radiators. January 2016 – fridge freezer replacement. In January we replaced the former separate fridge and freezer with a single combined fridge-freezer. Although considerably larger in combined volume, the new fridge freezer replaced a freezer that I’d had for over 25 years so I anticipate an energy saving there. The new fridge-freezer is rated A+ at 496 kWh/annum. April 2016 to September 2016 – charger control project. Development of the charger control project shifts some electric car charging from overnight bought electricity to daytime free electricity even in winter. Previously even on a sunny winter’s day I probably wouldn’t have charged in the daytime due to a risk of import ruining the economics, but now I just leave the car plugged in virtually all the time and let the charger run automatically if and when sufficient free power is available. July 2016 – double oven replacement. In July the failure of the fan on the oven prompted a oven replacement as the old fan was inaccessible for replacement due to corrosion of the surrounding bolts. I’m not sure how old the prior oven was (although I have evidence of the kitchen being remodelled in 2005) , but anticipate an efficiency gain due to replacement. The new double oven is rated A/B – i.e. the smaller oven is efficiency A and the larger one efficiency B.
December 2016 – storage battery. Installed too late in December to have much of an influence here, the ability of the battery to capture electricity that would have been exported as surplus to requirements for later use should reduce bought electricity. The secondary ability of the battery to storage cheap night time electricity for later day-time use is likely to be of interest only in the winter months, and then won’t reduce demand (indeed it will increase demand slightly due to its round-trip efficiency) but it will reduce costs. It will be interesting to see how this develops through 2017. This entry was posted in Energy on 03/01/2017 by Greening Me.